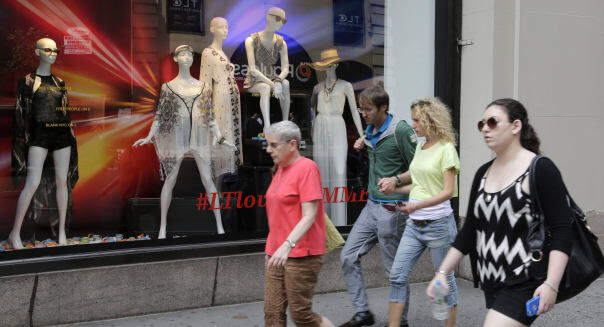 U.S. consumer sentiment fell in August to its lowest since last November while a barometer of current economic conditions rose to its highest since July 2007, a survey released Friday showed. The Thomson Reuters/University of Michigan's preliminary August reading on the overall index on consumer sentiment came in at 79.2, down from a final reading of 81.8 the month before. It was below the the median forecast of 82.5 among economists polled by Reuters, and was the lowest since a reading of 75.1 in November of last year. "While the data implies differential prospects for retailers, consumer confidence remains at moderately positive levels, high enough to support a continued expansion in personal consumption during the year ahead," survey director Richard Curtin said in a statement. The survey's barometer of current economic conditions rose to 99.6 from 97.4 and above a forecast of 97.8. The survey's gauge of consumer expectations slipped for a fourth straight month, to 66.2 from 71.8. The subindex was below an expected 73 and was the lowest since last October. The survey's one-year inflation expectation rose to 3.4 percent from 3.3 percent, while the survey's five-to-10-year inflation outlook rose to 2.8 percent from 2.7 percent. "Importantly, upper income households reported quite substantial financial progress," Curtin said. "But they reported the same sized losses as lower income households in their outlook for the overall economy."